1) Take Test light and voltmeter. Unplug one of the coils or fuel injectors and find the dark green/orange wire. This is for the ASD relay. Ground the black lead of your voltmeter and set it to 20v DC. Use the red lead to probe the dark green/orange wire in the connector. This wire should power up for about a second when the key is first turned on and then it should stay powered up constantly when cranking. Check both situations and let me know what you see. Result: When i put the key forward on the on position is 10.90 and when i start it up is 10.82. 2) Did you check for spark on just one cylinder or did you check at least a couple cylinders? Did you check by inserting a spark plug or spark tester in the end of the coil, grounding the test or plug and cranking the engine over? Result: removed the 2 front coils one from each side,and no spark. For this case first check for any codes set. If there is still nothing set then disconnect the cam sensor. The cam sensor is mounted on the side of the right bank cylinder head just forward of the exhaust manifold. It's held in with a single bolt and has a three wire electrical connector. i suggest to disconnect the cam sensor, crank the engine for ten seconds and see if it sets a P0340. There are multiple possibilities for this problem. If there are no codes setting on their own then that makes it tougher to diagnose since anything that causes a loss of spark should set a code. If you can get a code reader or scan tool on it and do this simple test that would be great. Please Note you have to unplug cam sensor and not crank sensor. 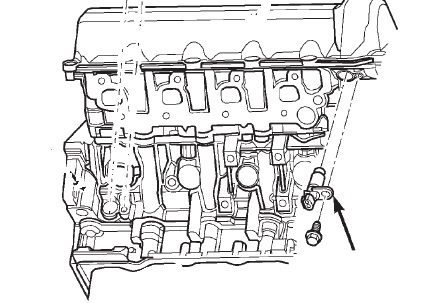 The crank sensor is the sensor in the right rear of the block by the starter. The sensor we want to unplug is the cam sensor, which is on the right cylinder head just forward of the exhaust manifold. About camsensor i would like to say: You can feel it from the top but not see it, but you should be able to see it (but probably can't reach it) if you look up from the bottom. Location of Jeep Grand Cherokee cam sensor. It's on the right side of the right cylinder head just forward of the exhaust manifold. If you face the engine from the front find the oil fill housing and then move your hand around the side of the cylinder head from there. Before you get to the exhaust manifold you'll find the cam sensor. Result: I got error P0340. Let's disconnect the crank sensor now too along with the cam sensor. Crank the engine again and see if it sets a P0320 also. If so, then we'll clear the codes, plug the cam sensor back in, crank it and see if it sets just a P0320. WHY TESTING THE ERROR CODE IS NECESSARY? The reason for unplugging the crank sensor and seeing if it sets a code is because we don't really have the equipment to see if the sensors are producing a signal. Nothing should cause a loss of spark without setting a code. I think what may be happening is the cam sensor is causing the crank sensor to not produce a signal. The cam and crank sensors share a sensor ground and a 5v reference voltage, the third wire at each sensor is the signal wire and goes to the PCM. What sometimes happens is the cam sensor will short internally and take down the crank sensor's 5v reference. When this happens the PCM doesn't know the engine is turning, so there will be no codes yet no spark. By unplugging the crank sensor and cranking the engine with the cam sensor plugged in that would allow us to see if it will set a crank sensor code or not. If it didn't set a code with it unplugged then we know the cam sensor is causing the issue. If you don't want to get back to the crank sensor and unplug it then as a next step I'd recommend replacing the cam sensor. If you do I'd recommend a Mopar sensor as aftermarkets are known to cause problems even when new. Mopar parts are of very high quality and good performing parts. The oil sender is on the left side of the front of the engine right next to the oil filter. The cam sensor is on the right side of the right cylinder head just forward of the exhaust manifold. Find the oil filler neck and slide your hand around the right side of the head toward the manifold and you'll find the cam sensor. See picture of it's location mentioned above, the picture is the right side of the engine and cylinder head as viewed from the right front fender area. The air filter box is on the left side of the engine compartment so removing it won't help. You can try removing the battery from the right side if you want and that will give you a little better access to the area.